Did Bear Stearns fail, or was it rescued? In March 2008, how you answered that particular question bled into your outlook on the rest of that year (and, apparently, forever after). If you chose to believe that the subprime crisis had been successfully handled by uneasy negotiation, the challenges everyone was confronting in early 2008 might not have seemed so insurmountable. It was bad, sure, but the worst had been done and authorites rose to the occasion. If, however, you took from Bear Stearns the possibility that “this” was only the beginning, that policymakers were faced with problems they didn’t even begin to understand, nothing much was left for surprise. I don’t just mean the technical specifics of why something like the Primary Dealer Credit Facility or dollar swaps were thought necessary, rather more big picture than all that. The week after Bear’s demise/rescue was announced to the world, the FOMC gathered for its regular scheduled March 2008 meeting.  There wasn’t really much talk about that one specific firm, though on the several occasions it was mentioned officials touched on what has come to define the world after this one investment bank was removed from the Wall Street ranks. Where Dudley, Bernanke, and the rest of the world’s central bankers went wrong was in misunderstanding the nature of what was right in front of them. Dudley gets this right, but adds the wrong context; it was rather more profound than he was making it out to be. This wasn’t a short-term reassessment, as the FOMC was thinking, it was systemic re-evaluation, the permanent kind. 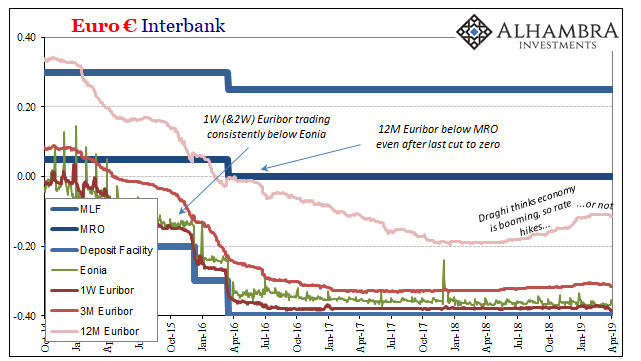 In other words, Bear’s final chapter didn’t just cause firms to rethink their liquidity strategies for tomorrow, it caused every single global eurodollar bank to really consider, most for the first time, what was actually at stake. Prior it was believed by everyone to be riskless returns. 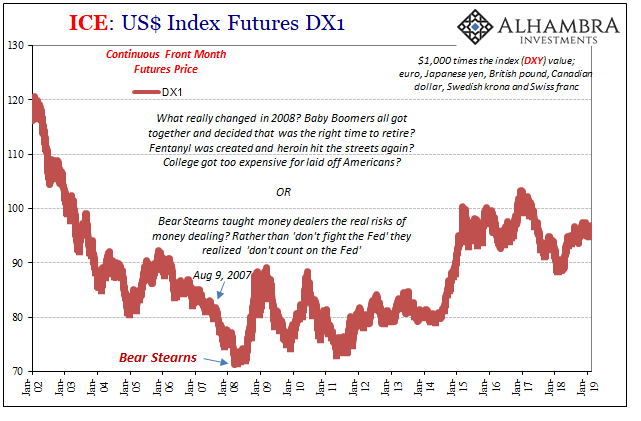 Bear taught them, via global dollar liquidity, it had really been the reverse. Why did DXY bottom out for good right then, or so many other indications point to the day of Bear’s announcement as the definitive break? Dudley provides our answer. Liquidity risk is paramount. Unfortunately neither he nor any other central banker could truly reckon its complete meaning. Officials never saw it that way and still don’t; they were, and are, incapable of such a realization. Economies are, in the orthodox textbook, treated as closed systems. There is no global economy to a central banker. CHAIRMAN BERNANKE. Exports continue to be an important source of final demand and will continue to contribute significantly to growth, although it’s possible that growth abroad may slow. Within months, of course, “global growth” abroad would somehow subtract even more from everyone’s local output once everyone was sucked into the hellish monetary vortex. Global money, global economy. Massive problems in global money, it’s only a matter of time before the rest of the global economy gets whacked, too. There can be no decoupling. Yet, over the many years since, the idea of global growth remains a powerful agent to set expectations. Decoupling is reborn every time monetary problems are. It happened in 2014, how when central bankers had trouble justifying their local optimism they would point to “global growth.” We may be struggling still, but someone out there isn’t and they will pull us out of the mess before it goes awry (again). One of the offshoots of that vagueness was “global growth”; as in “the global economy is improving” so the local one will certainly follow. In many ways this was even more convenient because of its impreciseness. It essentially established an unfalsifiable premise: somewhere out there in the vast world there is growth, so soon there will everywhere be growth. It’s not logic so much as desperation. And it works both ways. That is, when things appear to be going the right way as in 2014 or 2017 global growth is a reason it should stay the right way. And when things start to go the wrong way, as in 2018, you can blame the sudden and unexpected lack of global growth for befouling a local system otherwise performing admirably. This was Janet Yellen’s message in 2015, the “overseas turmoil” which the US economy abruptly had to deal with. 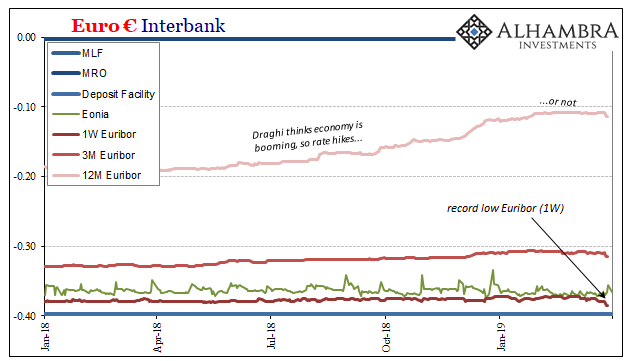 It is now Mario Draghi’s message in 2019 as he tries to explain how one year Europe was booming in near epic fashion and the very next it is on the verge of, if not already partway plunged into, contraction. The last year has seen a loss of growth momentum in the euro area, which has extended into 2019. This has been predominantly driven by pervasive uncertainty in the global economy that has spilled over into the external sector. So far, the domestic economy has remained relatively resilient and the drivers of the current expansion remain in place. The domestic European economy is awesome, thanks to Draghi, but the “external sector” crippled by “pervasive uncertainty” is in danger of spoiling everything. The true miracle of global growth; it can be whatever your narrative needs it to be. 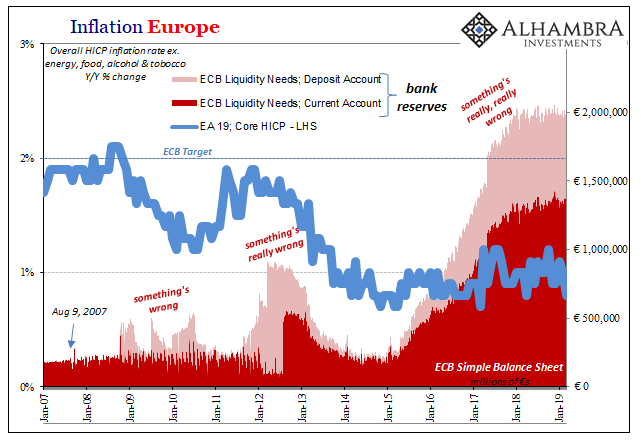 It is, therefore, no mystery as to why no matter what the ECB does or doesn’t do nothing ever changes. Not really, certainly not meaningfully. It’s not within the central bank’s power. European inflation in March 2019 was marked downward again, the core HICP rate just 0.8% and closer to a record low than anything resembling even the start of the boom Draghi was talking about not all that long ago. It is, put together, the two factors central bankers aren’t able to comprehend. And these may be the only two factors that matter. 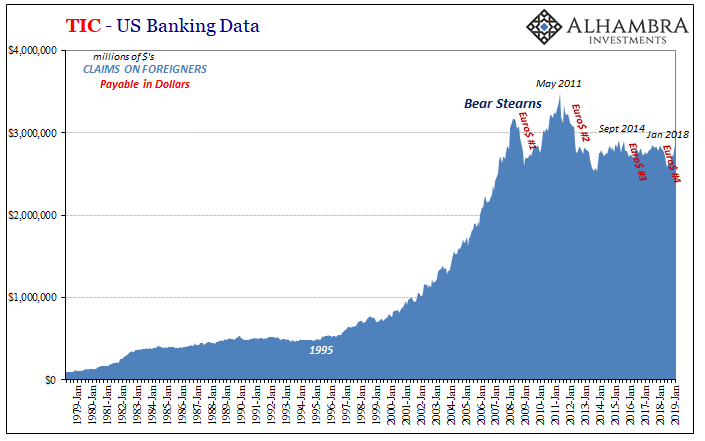 Bear showed the system’s necessary banks the real downside to liquidity, eurodollar liquidity (in all its various degrees of dark leverage, dark or shadow money forms). “Global growth” means how a global monetary system wrecks every idea about closed systems with central banks central to each (a major theme of my presentation at Harvard this past weekend).